CAVAJ Java Decompiler is a free open source Java decompiler for Windows that can transform java applets, mobile apps and archives back into human-readable code. 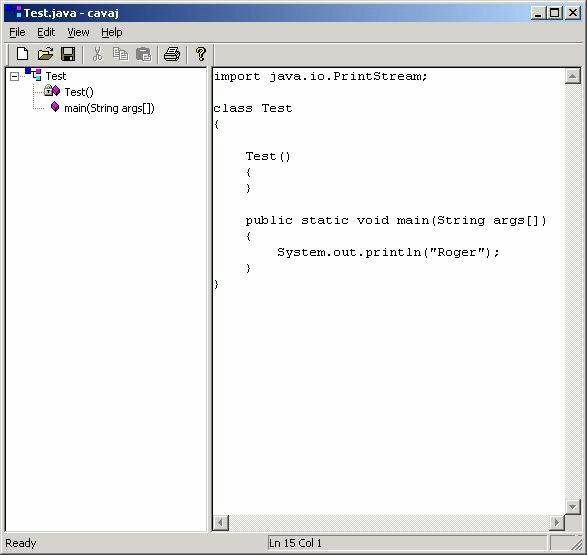 If you’ve been searching for a Java decompiler for Windows, CAVAJ is worth a look! The first thing we love about this lightweight open source decompiler contains no Java dependent libraries, so you’ll be able to work with code even if the machine you’re working on doesn’t support Java. As soon as you open the program for the first time you’ll notice how clean and simple the interface is – quite notable for a decompiler! It’s built on the standard IDE interface that most programmers and reverse engineers have come to know and love, and you even get a nice little status bar at the bottom of the program window that shows how fast/long an operation has until completion. While you won’t need to be an expert to perform basic decompiling functions but you might need some more advanced know-how to decipher more complex archives with this program. This is not like the C decompilers of yore that walked you through what everything did – it simply shows you the compiled byte code, not list everything out for you to reverse engineer for your project. It’s important to note that you can easily run into an info-dump of random variables, operators, and letters when decompiling large or messy archives that can make it hard to decipher what you’re looking at. CAVAJ Java Decompiler has a tendency to frontload a lot of code in a way that just won’t make sense, and you might need access to more advanced deciphering techniques to really understand what you’re looking at on the screen. Another gripe we have is the fact that there is no syntax highlighting included with the program like you might see in some other comparable decompilers. This means that if you’re just trying to find a specific variable or class you might be out of luck, depending on what method the decompiler uses to decipher the data. If you’re looking for a fast and easy way to decompile Java files, archives, applets, etc. CAVAJ Java Decompiler is fantastic – but if you’re a newbie to Java looking for syntax highlighting and help, you’ll want to find another program. Decompile Almost Any Kind of Archive CAVAJ Java Decompiler can decompile virtually any Java applet, app, archive or file within a few minutes. Fast and Easy to Use This decompiler works fast and features a clean and stylish IDE interface. You Don’t Need Java to Run It CAVAJ isn’t built on Java so you can run it even if Java isn’t installed on your local machine. Can Require Expertise to Decipher More Complex Archives The default deciphering mechanism can be clunky and frontload variables in a weird way; some expertise may be required for advanced operation. Missing Syntax Highlighting You won’t be able to highlight by specific syntax or variable.